SCVHistory.com | Lang | Sale of John Lang's Ranch, 1886-1889. Sale of John Lang's Ranch. 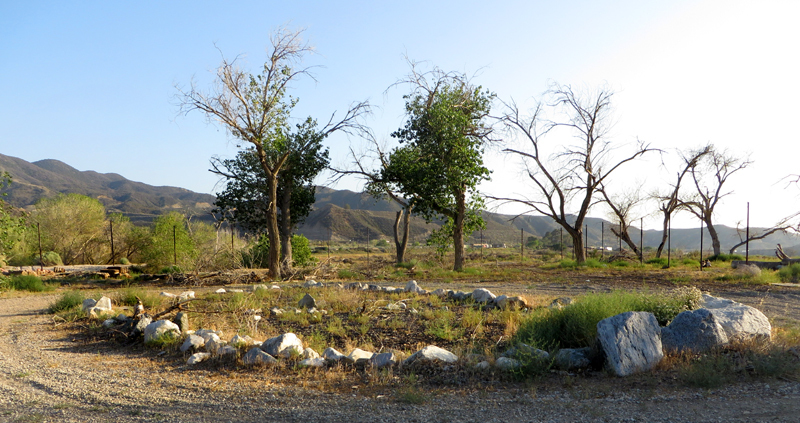 6-7-2014: Westely view across the old Lang Ranch (near today's River's End RV Park) toward the former SPRR Lang Depot site in the distance. Click to enlarge. John Lang arrived in Soledad Canyon in 1870 and, with the arrival of the Southern Pacific railroad, tried to make a go of it as a hotelier and resort owner serving travelers who stopped at the depot on his property. It was a struggle. 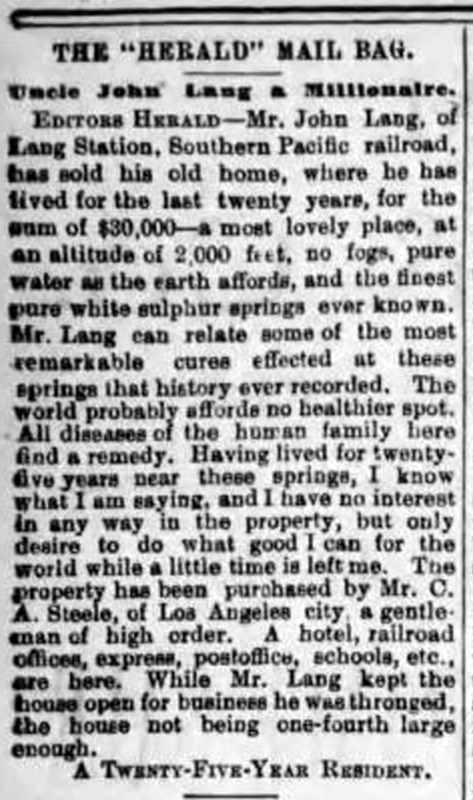 As noted below, he built a two-story hotel in 1884 and named it the Sulphur Springs for the smelly water that gurgled up from the Santa Clara River bed — which Lang insisted was a curative for every respiratory ailment short of tuberculosis — but in 1886, he put the entire ranch on the market for $25,000, claiming he was too elderly to deal with it. He held on for three more years, apparently failing to find a buyer at that price until 1889 when C.A. Steele of Los Angeles came along and gave him $30,000 for it. The ranch evidently had been sold again by the time the hotel burned down and the property was devastated by a 1906 wildfire that cut clear through to the Newhall Pass (see Meryl Adams 1988:145). Others would try their hands at operating the property as a resort in the 20th Century, with similarly modest results. In the 1930s it may have been a resort called Anderson's (further research is needed); much of it eventually became River's End RV Park at 13130 Soledad Canyon Road — which once offered a wide variety of recreational opportunities, from swimming and trout fishing to miniature golf and clubhouse activities, but no longer does so. Los Angeles Herald | Tuesday, October 12, 1886. A fine opportunity is offered for investment. I now offer for sale the entire property at Lang's Station, on S.P.R.R., forty-three miles from Los Angeles city, north, in Los Angeles county, consisting of the following: 240 acres of fine land with abundance of water to irrigate every foot every day of the year — never fails. Fountain head on the land and is located on the highest ground at the head of the ranch, where it can run in ditches all over the property, which it is doing at the present time, and besides this water there is about ten fine white sulphur springs on the place, admitted by every test to be the finest on the Coast. About twenty-five acres of bearing orchards, all kinds of fruits; one orchard thirteen years old. Everything very healthy. Never any scale bug known in this section. Vineyards, flower gardens, fine two-story hotel only two years built, neatly finished throughout. Depot, postoffice, express and ticket offices here at hotel door. Schools convenient. No fogs. Altitude 1,820 feet. Title to land, water and everything perfect. Am not particular about full payment down, as the property is good security. This is no doubt the finest opportunity in the State for establishing a large, paying and attractive health resort, the sulphur springs being in beautiful groves of very large growth, completely shading them. These springs boil up in plain sight, clear and sparkling as a diamond, beautiful to drink. During my sixteen years' residence right here at these springs, I have yet to find the first one coming here with asthma, dyspepsia, coughs, chills, liver complaints — almost everything not seated consumption — but left here entirely cured. I believe this the healthiest spot the sun shines on. Were I 25 years younger this property could not be bought for twice the amount I will take now, which is $25,000. Age demands of me retirement from an active business life, hence for the first time I offer to sell. Now let no one think this is a speculation on my part. I have an adjoining ranch where I intend spending the balance of my life privately, on account of health, believing I will live to a greater age. Address all communications to the proprietor. Uncle John Lang a Millionaire. Los Angeles Herald | Sunday, August 18, 1889. Editors Herald — Mr. John Lang, of Lang Station, Southern Pacific railroad, has sold his old home, where he has lived the last twenty years, for the sum of $30,000 — a most lovely place, at an altitude of 2,000 feet, no fogs, pure water as the earth affords, and the finest known pure white sulphur springs ever known. Mr. Lang can relate some of the most remarkable cures effected at these springs that history ever recorded. The world probably affords no healthier spot. All diseases of the human family here find a remedy. Having lived for twenty-five years near these springs, I know what I am saying, and I have no interest in any way in the property, but only desire to do what I can for the world while a little time is left me. The property has been purchased by Mr. C.A. Steele, of Los Angeles city, a gentleman of high order. A hotel, railroad offices, express, postoffice, schools, etc., are here. While Mr. Lang kept the house open for business he was thronged, the house not being one-fourth large enough.